There's NO such thing as an albino horse! ***Albinism is caused by a recessive gene, meaning an animal must carry 2 copies of the gene, one from each parent, in order to express the color (or rather, lack there of). One copy of the gene has no effect on coat color. Because of this, 2 albinos bred together will always produce an albino. *** As you will read below, this simply does not happen in horses because no white horse's coat is caused by a recessive gene, and none of these white horses breed true as an albino would. So where do "white" horses come from? From several different genetic patterns, as a matter of fact: the grey gene, the cream gene, the sabino gene, the splash white gene, the so-called "dominant white (W) gene," and occasionally from extreme overo, tobiano, or tovero patterns. 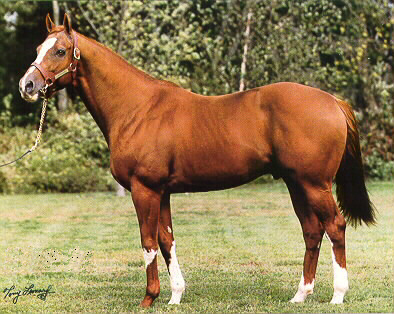 The key idea to keep in mind, however, is that all of these genes act only to modify the horse's existing coat color---essentially they serve to block pigment from otherwise dark hairs---they are not really a color in the same sense as bay or chestnut. For a short introduction to the basics of horse color, please visit this page. 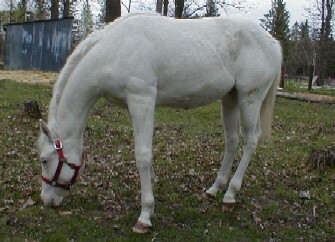 Grey: Many people see a horse like the one pictured at left and assume he is white. He is, however, a grey. Grey is a gene that modifies a horse's coat color, no matter what it is, and causes it to de-pigment with age, much like human hair changes color as we age, whether we're blond, brunette, or red-headed. All grey horses are likewise born "dark," be it black, chestnut, bay appaloosa, or palomino. As they age, their coat changes, often going through a dappled phase which is usually quite lovely. Some grey horses will never turn entirely "white," retaining traces of color in their manes and tails or on their knees and hocks. Some even develop little flecks of color throughout their coats, known as flea-bitten grey. But most importantly, no matter how greyed-out they are, grey horses are genetically grey, never white. 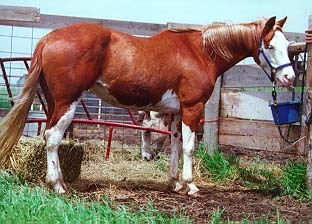 Several pinto patterns are responsible for creating "white" or nearly white horses. Pinto, like grey, is really not a color, but rather a color modifier. 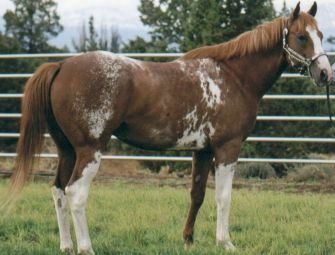 It acts by removing pigment from areas of hair on an otherwise solid colored horse, creating the splashy patterns we see from Paint horses to Clydesdales. All pinto patterns are dominant! The most common one is sabino, a pattern of white that is expressed in its minimal form as stockings and a blaze. Moderate sabinos frequently have belly spots and white patches on their sides and shoulders. Extreme sabinos can be almost entirely enveloped by the pattern and thus look white. Most extreme sabinos retain a little color along their toplines, especially in the mane or on the ears. Breeding sabinos together may result in an offspring with even more white in their coat than the parents, but not always. 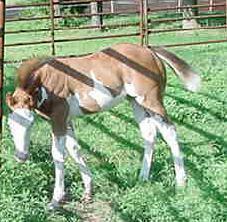 Producing extreme sabino foals from extreme sabino mares or stallions has been a fairly unusual phenomonon until just recently. As more breeders today are breeding for color as well as function, extreme sabino families are slowly becoming more common. 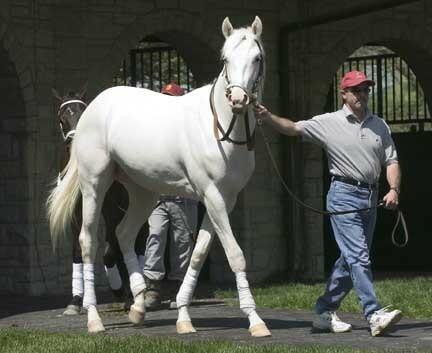 By no means do extreme sabinos throw that color on a regular basis---another nail in the coffin of the idea of true-breeding white horses---many produce moderately expressed sabinos. Below are some examples to show the range of sabino expression. From left to right, they are Marquetry, Airdrie Apache, Puchilingui, and The White Fox. Breeding for wildly patterned sabinos has become more popular in Thoroughbreds in the last few years. 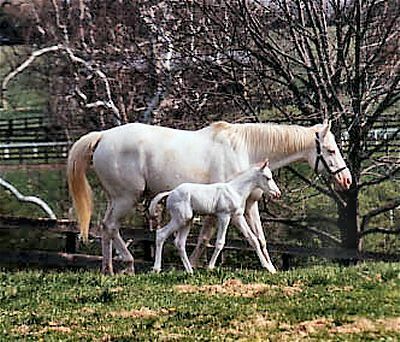 A few families have produced an unusual number of extreme sabino foals, the most notable of which is Patchen Beauty and her kin. 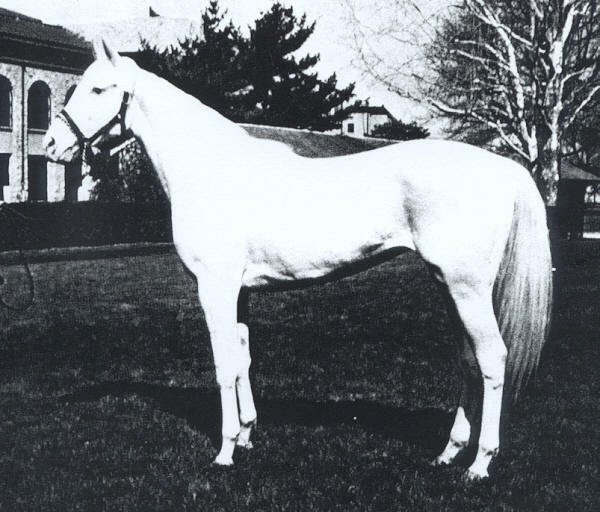 The family began with White Beauty in 1963, an extreme sabino mare who, out of 6 foals, produced 1 extreme sabino foal and 3 chestnut foals with slightly less extensive sabino markings. One of these, a mare named World O'Beauty (born 1972), produced 2 extreme sabino fillies including Precious Beauty in 1981. 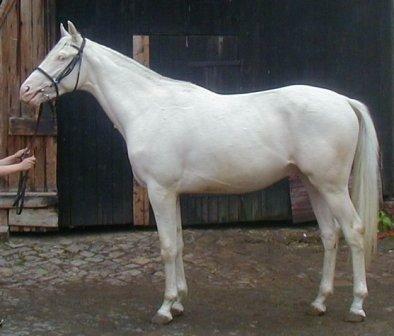 And she, in turn, is the dam of the famous Patchen Beauty who has produced 3 whites foals to date. 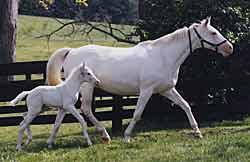 The White Fox is the only one of her foals to race so far (he is pictured above on the far right). The horses pictured below, from right to left are: White Beauty, Precious Beauty with Patchen Beauty as a foal, Patchen Beauty, and Patchen Beauty with The White Fox as a foal. Truly a remarkable family! Even though Patchen Beauty and her family are regular producers of extreme sabinos, it should be remembered that such prolific color production is quite unusual. 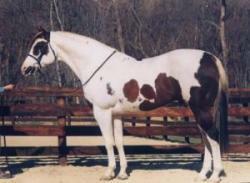 Another pinto pattern that can cause completely white horses is called splash white, shown below. It is similar in appearance to sabino, in that the white pattern seems to "creep" up the horse starting with the legs and then belly. Most splash whites also have extreme face markings, sometimes even entirely white heads like the horse on the right. 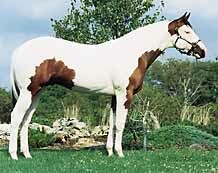 In its most extreme form, splash white leaves little or no color along the topline. Many splash whites are deaf. Occasionally, tobianos and overos, or combinations of both,will exhibit such an extreme pattern that they are almost entirely white, as seen below. The horse on the left is a tovero. His pattern has been restrained to just his head, chest, and flanks (also known as a medecine hat).The horse that is second from the left is Designated Hitter, a homozygous tobiano who I suspect may carry overo as well. His other side has far less pattern on it. The horse that is second from the right is an extremely marked tovero---the only color remaining unmasked in his coat in a spot around his eye and a few on his barrel and flanks. The horse at right, PPQ Spirit of Romance, is an extreme tovero, and his color is entriely masked by the pattern. 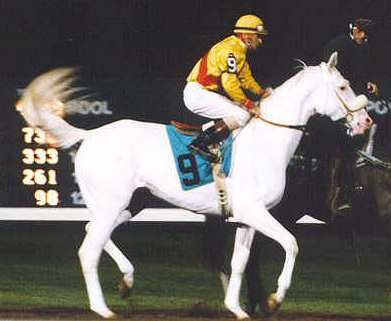 Though he looks entirely white, he is technically a pinto, and his offspring could be both pinto and solid-colored, as is true for the other horses pictured here. Dominant White? 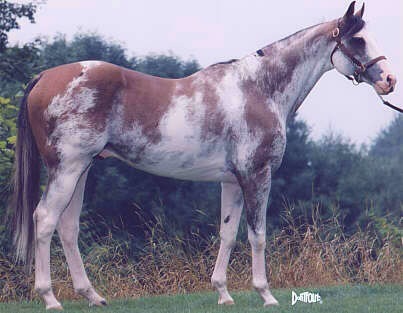 The idea of a dominant white gene has fallen in and out of favor among students of equine color genetics over the years, and until very recently, it was assumed to be a variation of the sabino pattern. (Sabino appears to be polygenic, and more than one complex of (likely related) genes can produce a sabino-type pattern. 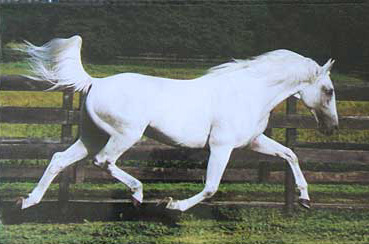 Extreme sabinos, all-white horses, are believed to be homozygous.) No evidence could be found of all-white horses that produced like-colored offspring, only those that produced a mix of white, white-patterned, and even solid foals. In 2007, a Swiss research team found and isolated the dominant white gene. The individuals that tested for the gene were all heterozygous, leading the researchers to speculate that the gene is likely lethal in its homozygous form. These horses were a mix of white and partially white-patterned horses; phenotypically, they appeared to be sabinos. As I've explained above, there is not one single, simple gene at work creating "white" horses nor are there true albino horses. They are the result of several unrelated genes, from cream to pinto. 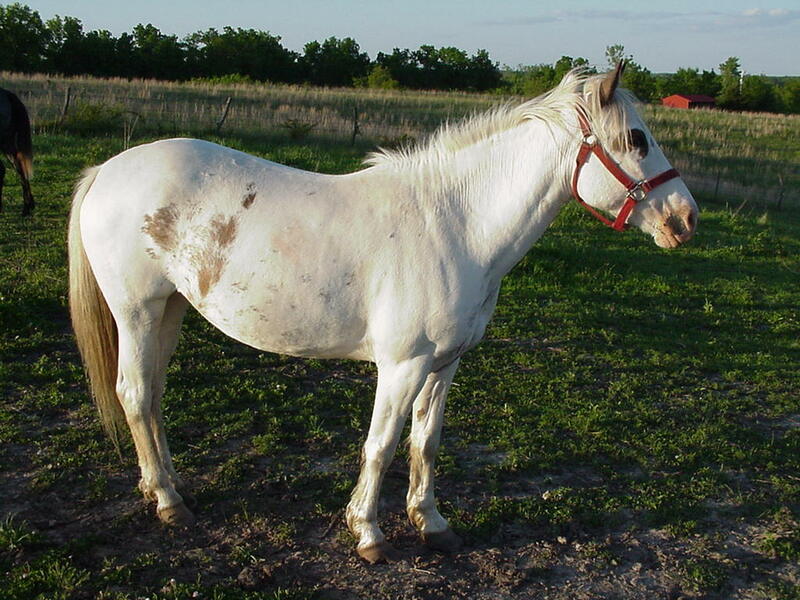 There is, however, something known as lethal white overo that can cause some confusion.